The Baton Rouge Bus Boycott which occurred in Baton Rouge, Louisianain 1953, was the first large-scale boycott of a southern segregated bus system. The Baton Rouge Boycott inspired the Montgomery Bus Boycotttwo years later. The boycott, however, remains controversial because many supporters felt its leader, Rev. T.J. Jemison, capitulated too quickly to city demands. The boycott was prompted partly by the 1950 decision by the Baton Rouge city council to support the financially strapped municipal bus company by revoking the licenses of nearly 40 competing black-owned companies. African Americans now had no choice but to ride segregated buses operated by the city-owned bus company. Blacks made about 80% of the bus riders on the city bus system but were required to sit back of the bus or stand even if the front seats reserved for whites remained empty. In January of 1953, the same day bus fares rose from 10 to 15 cents for all riders, Reverend T.J. Jemison, pastor of Mt. Zion First Baptist Church, the largest black church in Louisiana, complained to the city council which in response passed Ordinance 222 which allowed blacks to sit in “white” seats if the bus was crowded and those seats were unoccupied. Blacks however, could not sit next to whites or in front of them. The white bus drivers’ union opposed Ordinance 222. 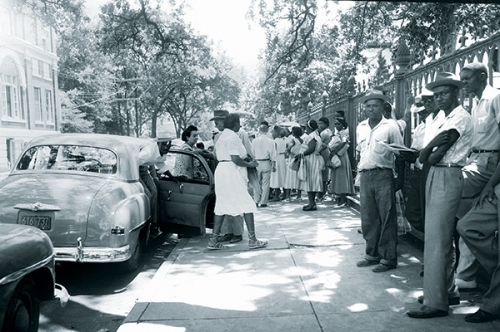 When two white drivers were suspended for not obeying the ordinance, the union went on strike on June 14, 1953. After four days of the strike, Ordinance 222 was overturned by Louisiana Attorney General Fred Leblanc who claimed it violated state segregation laws. The white bus drivers returned to work but Rev. Jemison, local businessman Raymond Scott, B.J. Stanley, head of the local National Association for the Advancement of Colored People (NAACP), and other black leaders, formed the United Defense League (UDL) that same day (June 18) to protest bus segregation. They called on black Baton Rouge residents to boycott city buses and urged them instead to ride cars, taxis, or walk to work. After leaders announced the decision at a mass meeting held at McKinley High School, meeting participants went door to door to inform residents and the local white-owned but black-oriented radio station, WLCS, also spread the word. The next day, as the city buses approached blacks at regular bus stops, the boycotters turned their backs to the buses. Hundreds of black automobile owners carried passengers for free to and from work and the UDL’s nightly meetings drew thousands of supporters. On the evening of June 22, over seven thousand black residents gathered at the city municipal stadium in support of the boycott. Facing financial ruin, the bus company and the city met with Rev. Jemison, president of the UDL on June 24. A compromise which became city ordinance 251, was reached. The company would reduce the number of white-only seats but blacks would still sit behind whites and would have to stand even if some white seats remained empty. Jemison claimed the compromise was the best that could be achieved but many including some in the UDL leadership, criticized his decision. Clearly the Baton Rouge Bus Boycott didn’t end segregation on the buses, but it showed that peaceful, well organized and supported grassroots protests could be effective in the Deep South. It also allowed the first religious leaders to get involved in the emerging civil rights movement and thus inspired Rev. Martin Luther King to lead the Montgomery Bus Boycott two years later. “Baton Rouge Bus Boycott,” Civil Right Movement Veterans, http://www.crmvet.org/tim/timhis53.htm#1953brbb; “Baton Rouge Bus Boycott,” Nashville Public Radio, https://www.npr.org/templates/story/story.php?storyId=1304163; “Baton Rouge Bus Boycott, Los Angles Times, http://articles.latimes.com/2003/jun/19/nation/na-boycott19; “Baton Rouge Bus Boycott, Know Louisiana: The Digital Encyclopedia of Louisiana, http://www.knowlouisiana.org/entry/baton-rouge-bus-boycott.